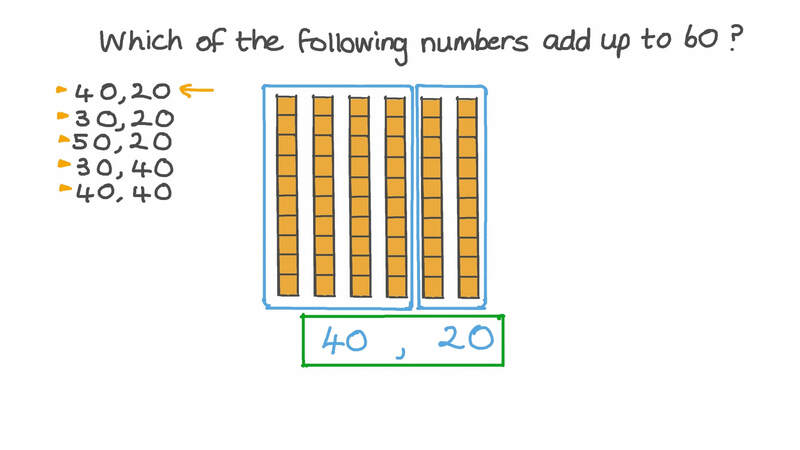 In this lesson, we will learn how to add two tens numbers with or without using base ten blocks. Find the two numbers from 10, 20, 60, and 0 which add up to 30. Which of the following numbers add up to 60? Complete the following: 4 + 3 = , 4 + 3 = t e n s t e n s , 4 0 + 3 0 = . What is the missing number? Hint: Add the ones and then add the tens. 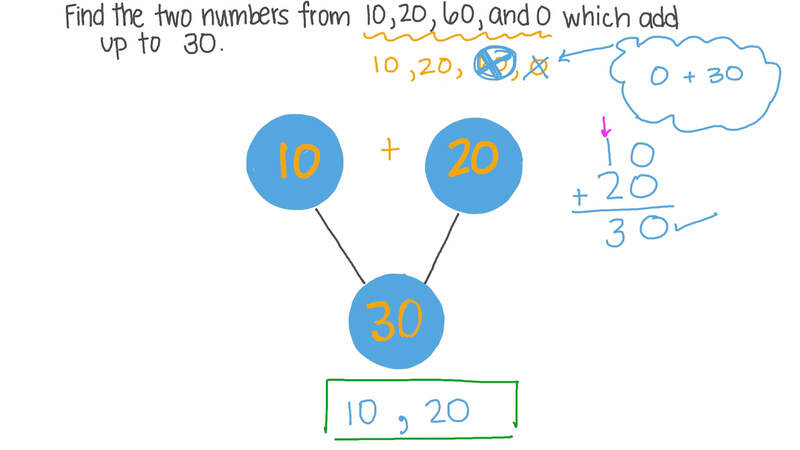 Find the number that when added to 20 gives 90. Nehal has 20 beads. She wants to add on 10 more. How many will she have altogether? Write the missing number: 1 0 + = 5 0 . Charlotte is adding 15, 8, and 28. She added the ones first. Add the tens to finish her work and find the total. Hint: Add the ones then the tens. Dalia spilled ink on her homework. How many tens are there altogether? Add to find the total. 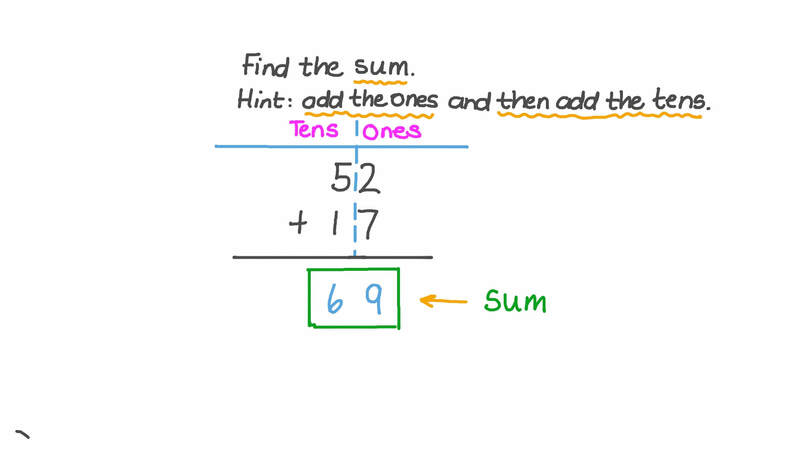 Hint: Think about tens and ones. Use base ten blocks to help you. 3 + 6 = . 3 0 + 6 0 = . Hint: Think about what happens when there are more than 10 ones. Hint: Add the ones then the tens. What do you do if you have more than 10 ones? 7 + 2 = . 7 0 + 2 0 = . 3 tens plus 4 tens is tens. 3 0 + 4 0 = . Hint: Add the ones then the tens. What happens when there are more than 10 ones? Ramy is using base ten blocks to help him add 9 to 34. He adds the ones first. There are 13 ones. Pick the model that shows what he should do. Fares spilt ink on his homework. Help him find the covered numbers. Pick a model that shows the sum. Look at how Dalia adds numbers.